One of the world’s largest collections of vintage bicycles and bicycling memorabilia is hitting the auction block in three installments, beginning December 1. Hundreds of bicycles — some dating back to the 1880s and before — will be included in the auction of items once housed at the Pedaling History Bicycle Museum in Orchard Park, New York, since 1991. 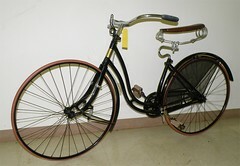 The museum owners, Carl Burgwardt and his wife Clarice, began collecting antique bicycles in the 1970s and opened the 7,000-square-foot museum in 1991. Located between Buffalo and Niagara Falls, the museum has been a destination for bicycle historians and vintage bicycle enthusiasts, as well as tourists and school groups. It was considered a showcase of American-made bicycles, many of which were made in the industrial corridor of the Northeastern US. For the past few years, the Burgwardts had been making plans to relocate the museum to the former home of the George N. Pierce Bicycle Co. in Buffalo. Those plans ended with Carl Burgwardt’s death from prostate cancer in May 2012. The Copake Auction company in Copake, N.Y., is handling the sale. Company representative Seth Fallon calls it a major auction for the firm that has been doing bicycle auctions for 21 years. The first auction on Dec. 1 includes some 500 items; similar auctions are scheduled for April 20, 2013, and sometime in the fall, probably October. 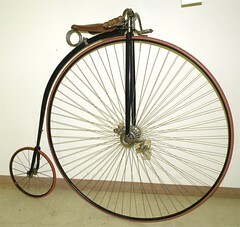 That first sale will include penny farthings and other high-wheel bikes, early safety bikes with pneumatic tires, as well as some modern bikes. Also bicycle-themed beer steins, photos, posters and other memorabilia will be offered, as well as old bicycle lamps and bells. 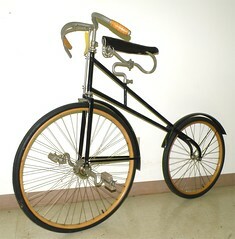 A description of all items in the first auction will be posted on the Copake Auction website bicycle auction page. Photos of bicycles and other gear and memorabilia in the sale is posted at Burgwardt Historic Bicycle Collection at flickr.com. Some of the bicycles included in the sale include the Victor JR 50-inch bike at top, the geared front driver Telegram below that, and the Columbia Ladies sprung-fork bike from 1890. 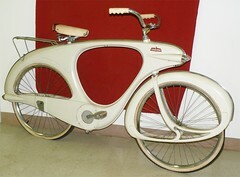 At left is one of the more recent bikes, a Bowden Spacelander. The Dec. 1 auction will be held at the company’s gallery at 266 E. Main St. (266 Route 7A) in Copake. Watch the website for details. It is a shame some company like QBP does not buy it and keep it open for the public to see. That’s a very good idea. It took the Burgwardts 30-some years to amass this collection of bicycles. It would be a shame for it to be lost. I like your idea of a corporation buying with an eye toward keeping it available to the public. Maybe one of the nation’s big museums, such as the Smithsonian, would be interested in taking the collection for a new museum wing dedicated to self-propelled transportation. the results of a passionate collector intact. Agree, the Smithsonian should purchase the collection and dedicate space to remind the public that self-propelled, environmentally safe and efficient transportation choices remain available. Actually, I think TREK ought to purchase the whole museum and move it to Madison, WI. It would be a wonderful boost to bicycling in the Mid-West.